I have the unfortunate duty of using this blog to announce the death a couple of weeks ago of Professor Leon B Lucy, who had been a Visiting Professor working here at Imperial College from 1998. Leon got his PhD in the early 1960s at the University of Manchester, and after postdoctoral positions in Europe and the US, worked at Columbia University and the European Southern Observatory over the years, before coming to Imperial. He made significant contributions to the study of the evolution of stars, understanding in particular how they lose mass over the course of their evolution, and how very close binary stars interact and evolve inside their common envelope of hot gas. Perhaps most importantly, early in his career Leon realised how useful computers could be in astrophysics. He made two major methodological contributions to astrophysical simulations. First, he realised that by simulating randomised trajectories of single particles, he could take into account more physical processes that occur inside stars. This is now called “Monte Carlo Radiative Transfer” (scientists often use the term “Monte Carlo” — after the European gambling capital — for techniques using random numbers). He also invented the technique now called smoothed-particle hydrodynamics which models gases and fluids as aggregates of pseudo-particles, now applied to models of stars, galaxies, and the large scale structure of the Universe, as well as many uses outside of astrophysics. Leon’s other major numerical contributions comprise advanced techniques for interpreting the complicated astronomical data we get from our telescopes. In this realm, he was most famous for developing the methods, now known as Lucy-Richardson deconvolution, that were used for correcting the distorted images from the Hubble Space Telescope, before NASA was able to send a team of astronauts to install correcting lenses in the early 1990s. For all of this work Leon was awarded the Gold Medal of the Royal Astronomical Society in 2000. Since then, Leon kept working on data analysis and stellar astrophysics — even during his illness, he asked me to help organise the submission and editing of what turned out to be his final papers, on extracting information on binary-star orbits and (a subject dear to my heart) the statistics of testing scientific models. Until the end of last year, Leon was a regular presence here at Imperial, always ready to contribute an occasionally curmudgeonly but always insightful comment on the science (and sociology) of nearly any topic in astrophysics. We hope that we will be able to appropriately memorialise his life and work here at Imperial and elsewhere. He is survived by his wife and daughter. He will be missed. 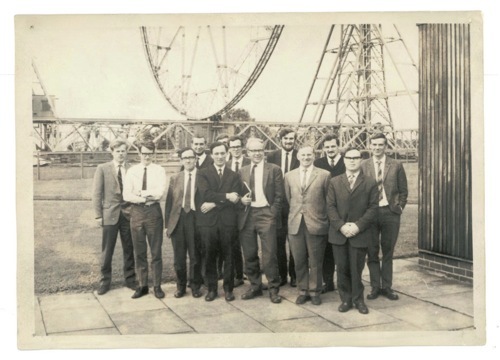 When cleaning out an office here in the Astrophysics Group in the Physics Department at Imperial College, we came across this photo: The background is the Mark I telescope at Jodrell Bank, and the man in the middle with the notebook has been identified as either Fred Hoyle or Francis Graham-Smith (which is more likely now that I look at it — thanks, Peter!). Do my astronomy colleagues (or anyone else) have any more information? I listened over the weekend to a story on the podcast of the radio show Studio 360 about Wanda Diaz-Merced, a blind astronomer. She is working hard at “sonification” — representing astronomical data in sound rather than in graphs. Of course, this works best for certain kinds of data — I gather from the piece that she has specialized in x-ray time series — and this seems to be the basis of her research as a graduate student at Harvard’s Smithsonian Astrophysical Observatory. I was bowled over by the passion and energy evident in the interview. I spend all of my days reading papers, staring at screens or pages of equations and graphs; were I to lose my sight I can’t conceive of how I would be able to go on as an astrophysicist. I hope that Ms Diaz-Merced finds all of the support she needs in our field — and great data to which to apply her techniques. This week I’m co-organizing a meeting at the Royal Astronomical Society in London, “Novel methods for the exploitation of large astronomical and cosmological data sets”. It’s an unwieldy title, but we’ll be discussing the implication of the huge flood of astronomical data for cosmology and astrophysics. How do we deal with the sheer volume — terabytes and petabytes of data for coming experiments (for example, the Large Scale Synoptic Telescope, one of the most important ground-based telescopes slated for the coming decade, will produce 20TB per night)? Human beings can only ever look at minuscule fractions of that, so we need computers to do much of the heavy lifting. So we’ll hear from both astronomers and statisticians about the science and algorithms we’ll need to cope. Paolo Padovani will discuss the worldwide effort to create a virtual observatory — a set of standards (and actual code running on actual servers) which allows uniform access to a wide variety of astronomical data. We’ll also hear from Imperial’s Professor David Hand, President of the Royal Statistical Society and Ben Wandelt of the Insitut d’Astrophysique de Paris about new methods for distilling signals from noisy data, and David van Dyk from UC Irvine about comparing complicated computer models with data. Finally, Alberto Vecchio from Birmingham will discuss one of the next frontiers, the challenges of doing astronomy not with light, but with gravitational radiation, which will allow us to peer closer than ever at neutron stars, black holes, supernovae, and others of the most exotic and exciting objects in the history of the Universe. The meeting is intended for professional astronomers, but open to all (there is a fee if you’re not a Fellow of the RAS). Unfortunately, I spent that time in a meeting room doing my part on STFC committees to keep the UK physics funding process moving along as well as possible during these still-troubled times. Now, I’m in the Macedonian Greek city of Thessalonika, lucky enough to have been invited to give a talk at From the Antikythera Mechanism to Herschel and Planck: 2500 Years of Observational Astronomy, organized by one of Imperial’s postdocs. I won’t let it go to my head, but it’s nice being treated as someone vaguely important: lunch with the vice-mayor, nice hotel, and amusing Thessaloniki swag to cart home (although when Ute Lemper came to sing she had lunch with the Mayor himself…). My talk is this evening, but the rain outside is precluding much local exploration, but at least I have some time to finish my talk (and write this). For me, home for about 12 hours tomorrow night, and then off to a Planck meeting in Rome and then Palermo. Finally let me also welcome Peter Coles to the astro blogosphere. His current prolixity is putting me to shame. Meanwhile, committees are meeting, the government is holding hearings, and we scientists are being quietly advised that, essentially, you attract more flies with honey than vinegar, so we’d better not start pondering the thought that, perish forbid, anyone had actually made a mistake getting to this increasingly difficult position. Let’s hope that whatever is going on behind the scenes is better than what we’re seeing out front. In his comment on last week’s post, fellow physicist blogger Tommaso lets me know that he’ll be attending a meeting that we’re hosting here at Imperial College next week, Outstanding questions for the standard cosmological model. We’ll be casting a critical eye over current cosmological models and data, but I expect most of us will come to the conclusion that the whole structure is surprisingly weather-sturdy. From IRAS to Herschel-Planck, July 9-7. This is a special meeting, in honor of Professor Michael Rowan-Robinson on his 65th Birthday. Michael is currently the head of our Astrophysics group, and is one of the founders of the field of sub-millimeter and infrared astronomy, using long-wavelength photons to observe those parts of the Universe often hidden behind clouds of dust — veiled stellar nurseries where indeed a significant fraction of the stars were formed in the universe’s first few billions of years. IRAS was the first large-scale infrared satellite, and Herschel (along with its sister spacecraft, Planck, about which you’ve heard plenty here) will be the next ambitious project to observe the whole sub-millimeter sky. By now you’ve heard that NASA has changed its mind and decided to send a mission to service the Hubble Space Telescope. Hubble has been an amazing instrument, its pictures seen and marvelled at by people literally around the world. The most amazing thing about NASA’s decision is that it’s front page news for the premier reporting organisations in the world, CNN, the New York Times, and the BBC. This interest should be humbling to those of who make our living in the world of astronomy. Moreover, of course, missions like this are dangerous — the Shuttle itself is creaky, and fixing Hubble will require five separate spacewalks. Astronauts have repeatedly expressed their enthusiasm for this mission, and we comparatively lazy and cowardly earthbound astronomers should be honored and, again, humbled. The Bush administration has cut $3 billion from NASA’s science budget over the next five years, “postponing” (until who knows when) important science in favor of getting back to the moon (in more than twice the time it took to develop the program in the 60s) and then to Mars. This comes on the heels of earlier revelations of the evisceration of NASA’s grants budgets, the money that goes directly to individual scientists to do bread-and-butter astronomy research, funding postdocs, travel and computers. Affected missions include big ticket items like the Joint Dark Energy Mission, which would search for the source driving the mysterious acceleration of the Universe, as well as satellites which would search for earth-like planets around stars in our own Galaxy. The only science missions to survive being indefinitely postponed are the Hubble Telescope’s $300 Million upgrade, and its successor, the James Webb Space Telescope. All while NASA’s overall budget — paying for the Space Station, the Shuttle and the Moon and Mars shots — has actually gone up. This is bound to reverberate even here in Europe, where missions like the LISA gravitational wave telescope were to be done as collaborations between NASA and the European Space Agency. Back in the early 90s, the American physics community felt a sense of entitlement, and didn’t bother to make the case for the Superconducting Supercollider, and science in the US and worldwide lost a chance to explore the frontiers of high energy physics, a benchmark which won’t even really be reached with the opening of CERN’s LHC collider in 2007. But that’s not really what’s going on here, not to the same extent. Astronomers remain aware of the PR aspects to our work — we understand that no one would fund something so manifestly useless if so many people didn’t find it as fascinating, compelling and beautiful as we do. This is, instead, just the Bush administration reneging on its promises (again, and as in so many more important instances) to protect its science budget. Update: meanwhile, PPARC in the UK is also cutting back on many of its science initiatives, too. Andrew Jaffe is an astrophysicist at Imperial College London. He can be reached at a.jaffe@imperial.ac.uk or @defjaf. Tod R. Lauer on Leon Lucy, R.I.P. Dr Strange on “Public Service Review”? yop on “Public Service Review”? No Bother on “Public Service Review”? Just a Chemist on “Public Service Review”? Dr Who on “Public Service Review”?